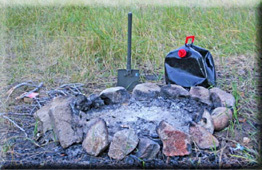 This is an ideal place to safely make a campfire. I’m making this fire in an existing fire ring. That way I don’t add an additional scar to the campsite. I have a camp shovel and five gallons of water. I’ve already sorted the firewood as to size. On the far left is the smallest tinder and then as you progress to the left of the photograph the diameter and the length increases. I have found dead branches and started by breaking off the smallest pieces and putting them in the small pile. As I continue to break the branches, they’re already sorted. Mother Nature grows them that way. Start by breaking off the smallest twigs first and progress to the larger ones. I start with the smallest tinder bundle, and two of the larger sticks. I place the larger sticks crosswise to make a foundation for the tinder. This allows for air passage. Air is essential for fire. The tinder is placed loosely on top. Ignite the tinder with strike-anywhere matches placed underneath the bundle of tinder. 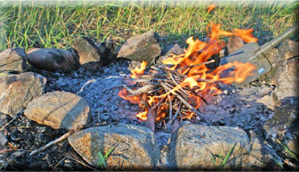 Once it ignites, add larger pieces of firewood to the burning embers. Place the larger sticks crosswise to the lower bundles. Progress until the campfire is the desirable size. Give this a few minutes to ignite and then progressively add larger firewood pieces. When done it looks like a fire haystack. Again add the larger pieces as needed. Now enjoy the flame and heat and allow it to burn down to the coals. 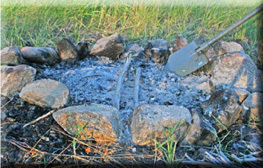 It is the coals that are the most useful for cooking. 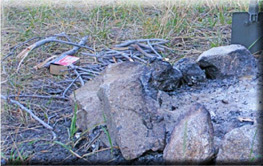 When making a campfire, it’s always advisable to observe the forest service fire regulations. The current fire danger is acknowledged. 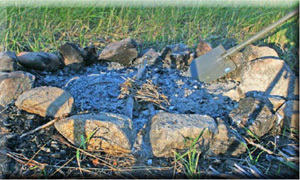 As the fire burns, continually watch the area for hot embers that may land on surrounding areas not in the fire circle. These embers can start an unwanted fire elsewhere. 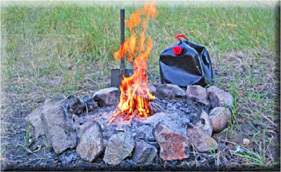 The shovel and water is handy to quickly put out any unwanted flames. 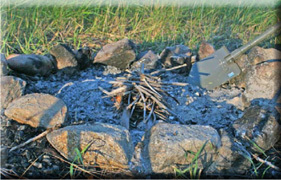 Never leave a campfire unattended because it may become a forest fire. The coals that are most useful for cooking have no noticeable flames, only red and white embers. 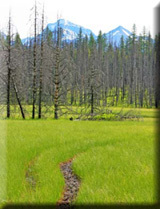 To help make campfires in wet and cold conditions, look for dead branches that are underneath trees to fuel the fire. Red pine needles are an indicator of dead branches. Also dead branches are easy to break away. This will not harm the tree. The red pine needles make excellent tinder and can even ignite when damp. Their branches are the driest wood in the forest because they are off of the wet ground. Also, fallen trees with dead branches sticking up from the ground are other useful sources of firewood.